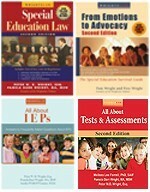 I can’t find any state that requires a candidate for a certified education position (reading specialist, LD specialist, special education teacher, elementary school teacher, special education director, principal, or any other position) to have training/certification in even one research based reading program. If we were graduating and certifying people who could teach reading they would be doing it. They may require the candidate to be well read on the subject of research based practices, but they do not require enough training/certification in a research based program to use it as it was meant to be used for instruction. Some teaching colleges will grant college credit if a student gets training in a research based program outside of the college. A few offer training at the college as an elective. But it is not required for graduation or state certification. We should not be surprised that people untrained to accomplish the goal are unable to accomplish the goal. If we were graduating and certifying people who could teach reading they would be doing it. What we are producing are people who can help a child learn to read as long as the child does not need direct systematic instruction in a research based methodology. Teachers are paying good money for a college education that does not prepare them to accomplish the job they will be hired to do. They have enough training to teach some of the children to read. To me, that is a piece of institutionalized discrimination that we have to change. We need to use our public money for staff that can teach all the children to read, not just the easy ones. This entry was posted in IDEA 2004, Reading and tagged Reading, Research Based Instruction, Teacher Training by Sue Whitney. Bookmark the permalink. This makes sense and the certification or lack thereof makes no sense at all!! I am a SpEd teacher in an Autism program and along with my colleagues, cannot understand why “we” aren’t receiving “special” or “additional” training for these Reading Programs our districts and state Ed depts are spending millions of dollars on!!! Half the time we are learning right along with our students. And since they are learning, they aren’t passing which equals “Epic Failure” for all!! 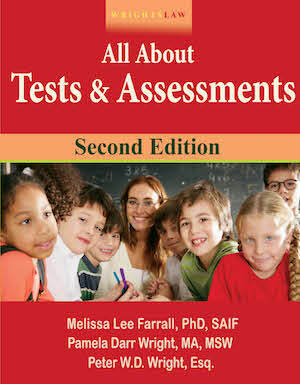 “They may require the candidate to be well read on the subject of research based practices, but they do not require enough training/certification in a research based program to use it as it was meant to be used for instruction ” This broad statement is not accurate.. Pre-service teachers in teacher education learn specialized methods for teaching reading that is contingent on many different learners strengths & deficits. They must know what to do in response to a child’s needs. This means they need to know how using several research based approaches. As such, teachers who go through special education, elementary education, and reading certification all receive explicit instruction in research based reading. Actually, sped training programs have NOT been focused on preparing teachers to teach reading. They have taught them a few methodologies but have NOT prepared them too understand the process of reading, reading development and making thoughtful, purposeful decisions to improve reading. In more recent years, some states have recognized this flaw in teacher prep programs and are not requiring teachers to obtain certification in teaching reading but this hasn’t always included special education teachers but that is also changing. In my opinion, special education teachers should be more than simply people who modify assignments but experts in intervention. To be experts in intervention means to require teacher prep programs to teach these skills, in depth. Sue, I was thinking are we putting too much on teachers? As I have sat in classroom over the years–I am fully sure general education teachers can do it–yes trainmg is needed..but even with differentiated instruction, can real education teachers do it all. The emphasis is onteacher training but should it be more specialized. I only sat as a teachers’s aide. Teachers are committed but not fully trained or supported and very stressed. How can they even teach struggling students to read? The reality–what do you do with older kids are 2-4 years behind in their grade level? You see, most schools do very little unless a parent is an advocate. Most parents do not catch the reading deficit. While, I love to discuss better teacher training–a generations of struggling readers is still emerging. Their are ways to remediate doing the middle school years but scholl are not investing in such students. They are being dismissed as illiterate. But, sucessful stories are out there. I totally agree with you! I have taught second grade in public schools for 13 years. I am amazed at the students that make it out of first grade passing and do not know vowel sounds and/or lack knowledge of phonemic awareness and other reading skills. Very little formal training is given to teachers on how to teach students these strategies and how to help students learn to apply them. Most of the knowledge I have gained has been through experience in the classroom and research done on my own time, which is how I got to this site. Teachers also should learn about the structure and layers of the English Language along with how a child develops phonemic awareness, how to teach phonics and decoding skills, rather than more whole language approaches to reading. Kids cannot be taught to read using ideography like in the Chinese language, when our system is based on an alphabetic system. One word….. ludicrous. Further many learning disabilities are in fact created in kids by using “so called” balanced literacy because it sets up conflicting learning habits causing a cognitive conflict! However, it is true that teachers are not trained in college on a particular, scripted, research-based reading system. But then, how many of us were taught to read with one? Basic reading is learned byt early exposure to reading, practice, and quality teaching and reading materials, not which scripted program a school purchased and uses. “Debbie” is right – the schools should be training their teachers to use whatever program they have, not the colleges. Colleges should teach people to be teachers, learners, and guides through education. They should learn theory, pedagogy, and how to appeal to all learners. They should not be learning how to follow a script and remove all reality from education. I totally agree with your article. I worked at a school where a special education teacher could not teach her students how to read. I am also a special education teacher, but was assigned to teach the gifted and talented that year. I volunteered to teach her students how to speak, read, and write using the Spalding Method, which another district trained me in. This teacher also teaches college courses in special education. She has deficits in teaching reading and writing. I do wish that there was teacher training in teaching all students to read. I have just completed my M.Ed. of Sp.Ed. & am a first year elementary Sp.Ed. teacher. It would be impossible for a teacher prep. program to subscribe to only 1 research-based reading program or to offer certification in all research-based reading programs. It would be a logistical nightmare for the university to keep up with public school changes regarding these programs. University classrooms are the “whole-group” instruction; school systems should then provide intensive teacher-training in programs to individualize instruction to student needs. This is 1 of the areas school systems are failing students. My requests for Wilson training go unheeded. I am paying for my own certification. It’s disheartening to be able to diagnose student needs but not be able to obtain the training to implement these programs with fidelity & integrity! where can I find a course in teaching children to read? The most fundamental learning “building block” for children to be able to enter into society is the ability to read. By failing to ensure total literacy across the board for all students emerging from our school system, regardless of any other factors, is a firm declaration that our system and basic approach to education is a failure. Take a look at the end-to-end treatment and actionable recommendations in the recently released commission report, “Education in America — What’s to Be Done?” developed by Trigon-International to see how this problem is best addressed. I completely agree. I am a certified regular and special ed teacher. I was most recently teaching upper elem at a school in IL. These students came to 4th-5th gr reading 2 yrs below grade level. The District was concerned when this spec. ed population did not meet state standard scores. It was my specific request to obtain training and a specific reading program to target the needs of these students and actually teach them to read. I even gave a copy of “Overcoming Dyslexia,” to my Principal and Spec. ED Supervisor. They denied my request and instead of offering these students specific direct instruction in a proven reading program, they requested the Reading/Differentiation Specialist to train us in implementing a paired reading along with other “strategies” to help them do better on state test. In my state the requirements for Deaf and Hard of Hearing certification had not changed in more than 30 years. It was only in the past year that the state department of education addressed this issue and has helped change and improved that requirement. I believe that the State Department of Education should also be at the head of this issue. When the students are required to meet standards for that state, colleges will provide the classrooms for them and school districts follow directly. 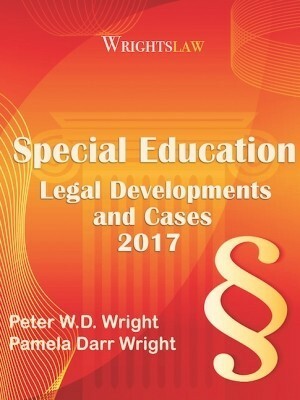 HOW CAN WE MAKE SURE THE PUBLIC SCHOOL READING RESOURCE TEACHER FOR LEARNING DISABLED CHILD IS CERTIFIED IN THE TEACHING METHOD AGREED UPON BY THE I.E.P. TEAM. THIS CHILD ONLY PROGRESSES WITH A PRIVATE CERTIFIED TUTOR IN THIS METHOD DURING THE SUMMER MONTHS. HE DOES NOT PROGRESS WITH THE PUBLIC SCHOOL TEACHER DURING THE SCHOOL YEAR. THE SCHOOL TELLS US THAT THE TEACHER IS CERTIFIED TO GEORGIA PUBLIC STANDARDS, BUT THIS DOES NOT MEAN THE TEACHER IS CERTIFIED IN THE METHOD THAT HAS BEEN AGREED UPON. THUS, WE SEE LITTLE TO NO PROGRESS. I DO NOT THINK THIS IS FAPE. Trudy: Sorry for the delay in addressing your concerns about Reading First. 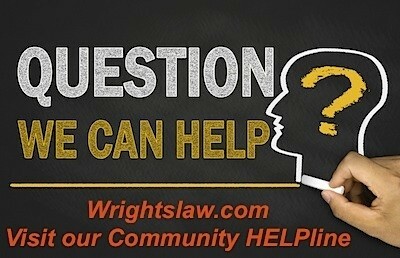 There is a still great deal of confusion about this and other programs authorized by NCLB. The purpose of Reading First, as stated in the law is to ensure that every child can read at or above grade level by the end of 3rd grade. Reading First provides funds for screening, diagnostic, and classroom-based instructional reading assessments for students in K through 3rd grade. Schools must use effective instructional materials, programs, learning systems, and strategies that are proven to teach kids to read. Reading First also provides professional development funds so all teachers have the skills to teach effectively. Because teachers must learn to screen, identify, and overcome children’s reading problems, RF provides funds for training so teachers have the knowledge and skills to teach children to read. It doesn’t sound like your district is implementing Reading First as intended. What concerns me is the fact that your son has serious reading comprehension problems, has developed severe anxiety to the point of being hospitalized, – but he hasn’t qualified for special education. That’s crazy! You need to obtain a comprehensive psycho-educational evaluation of your son by an expert in the private sector who has expertise in reading disorders. This person should be willing to meet with the school staff face-to-face to describe your son’s problems, the educational program he needs, and what will happen if the school continues to drag their collective feet. As an education major, I can attest to the fact we are not required to take any classes for training/certification in a research based reading program. The instructor I had for a one semester reading class is a certified reading specialist so I was able to receive some great training, albeit surface training only. We do have reading specialists at all our schools but intense, one on one assistance is only covered for one semester. Group instruction then takes place for those, like my son, who are still struggling. One major criticism I have is the Reading First program, or at least as it’s been implemented locally. There are no provisions for alternative assessments. It’s fill in the bubble and answer multi step essay type questions. For students such as my son who have documented problems with reading comprehension but has so far not qualified for services, it’s meant going from B’s in reading to D’s and F’s. Panic attacks landed him in the hospital twice in April. While the program is supposed to be research based, because of discussions I’ve had with several teachers I know the reason the district chose to ditch another program that was very effective and seek a Reading First grant was simply for the money alloted for technology in the classrooms. Technology is great but some flexibility has to be embedded in a reading program for students who struggle with comprehension and/or taking fill in the bubble assessments. This issue is more fundamental than other types of training or individualizing an educational plan. 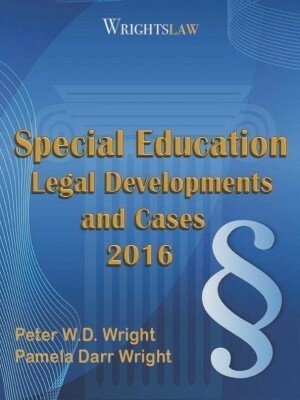 It is not a question of states requiring certification to teach the disabled. Very few teachers are using effective reading instruction for any children, not just those with disabilities. About 60% of us will learn to read without any effective instruction. The other 40% will not. (Even the 60% won’t do as well as if they had effective instruction). There is not a problem with a college teaching a reading program that won’t match what their eventual employer will use. The science shows what elements should be included in any effective reading program should be. The many different effective programs are similar. It shouldn’t be the school’s job to train certified teachers. Untrained people should not have been granted certification in the first place. Doing so means the state is really only interested in teaching the non-disabled kids. 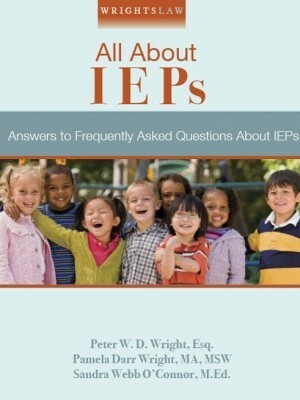 No matter what the public relations campaigns say, if any state was interested in educating all children they would require the people they certify to be able to do the work required to meet the stated goal of educating all children. 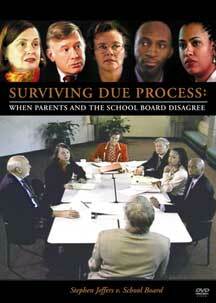 I agree with you in principle; parents should not have to police the system. My experience tells me that in reality, we do have to. Right or wrong, if I do not consistantly follow up on my child’s education, it will fall short. If this is to truly be a team effort, with me being the only constant on the team, how could I not need to police the system. I don’t believe anyone in the school systemn intends students to “fall short”. I think they have good intentions at heart. They may have different priorities, different pressures than I do. That is why I am a part of the team. I also agree that certification should mean the person has received direct training in how to utilize that program effectively. Each program should ideally require individual certification. That is why I don’t see it as part of the college program. This is part of ongoing training for a teacher, whatever the title, who will be using that program. I certainly have no objection to this type of instruction in college for teachers. I just would not depend on it as a parent to be sufficient for a teacher who proposes to teach my child to read. Why should parent s have the job of policing a system that is designed to fall short? 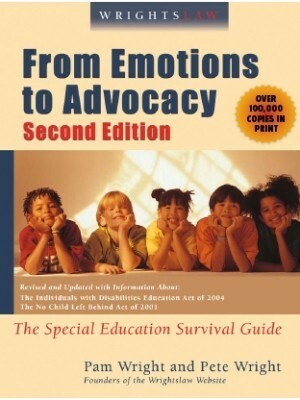 It is ridiculous for a state to take state and federal money and run a credentialing system that certifies teachers in all endorsement areas who are still untrained to teach the state academic content standards for phonological awareness, decoding, vocabulary, comprehension, and fluency to children with learning disabilities using research based programs. 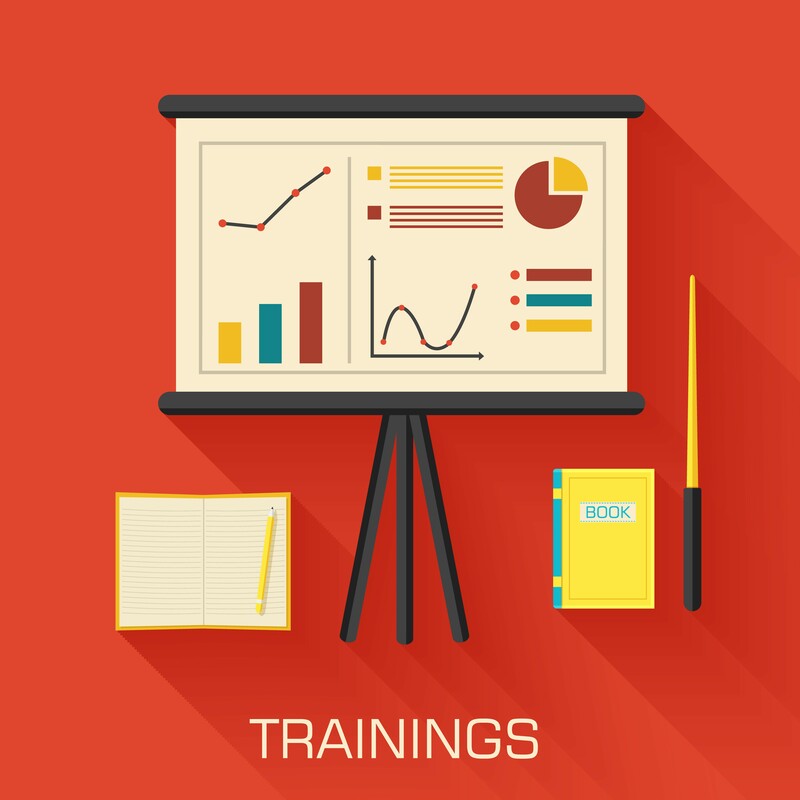 There are training programs in Wilson, Orton Gillingham, Slingerland, Lindamood Bell, etc, located all over the country [ http://nhida.org/teachertraining.htm ] . We know a school needs people trained in research based programs in order to teach all the children in the school. Certification needs to mean training in the research based programs needed to accomplish the task. It doesn’t. It means the person holding the certification has read about accomplishing the task. When do we think we might stop throwing good money after bad? When do we think your typical garden variety dyslexic kid will be able to learn to read along with his classmates without his parents hiring years of private tutors and a full legal staff? While I agree that one needs to be trained to effectively use a particular reading remediation program, how could any college do that training? There are many research validated programs out there now. Which one a teacher uses is more likely to be based on which one the district purchased than on which one will actually teach a particular student to read. And if the college spends the time to train in one program, and the teacher is expected to be able to utilize another (because after all, s/he got that training in college), how does that help the child? I believe it is most important for parents and advocates to confirm that a research validated program is in fact being used and that the district has provided the teacher with the training to be certified in that program. I completely agree. Our school’s “language arts specialist” isn’t trained in any specific reading program. We don’t have a reading specialist. The teacher who will be teaching intervention reading to my child next year, when quizzed about how long a reading lesson should take, said she took a “short course” and will be teaching “a short lesson.” She continues to assert that my child just needs to be forced to read out loud to improve fluency. She is completely ignoring the research (and my child’s test scores) that shows that he doesn’t have the basic skills (e.g., phonemic awareness, etc.) to improve his fluency. The lack of teacher training is absolutely ridiculous. And anytime I question anyone’s training, it’s always taken as a personal attack. I agree that many colleges are not preparing students for the “real world” classroom. I think that they should be providing students with these research based reading programs, as well as providing them with a mentor-ship or observation type opportunity where they can see these research based methods being implemented. Many teacher prep programs only have their students get into the classroom the last few semesters of their coursework. I think that it would be ideal if the student could take the class and also pair that with real life class experiences, where they implement the methods themselves or are able to observe a veteran teacher implementing the methods. Reading about the strategies is different then implementing them, especially since accommodations always need to be made. With the classroom becoming more diverse each year, it is important that colleges recognize where they are falling short with preparing their students. 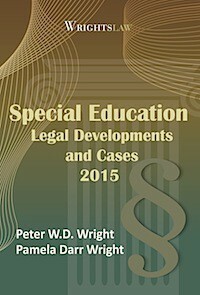 No one canl ever argue that training is a big issue with Special Education. The frustration that we have felt as parents is Schools strive for excellence in general education and the minumum in Special Education. These minimum requirements allow your child’s bus driver to be an assistant in their class and act as the reading, math or history teacher. When my wife and I think of a “change”, we think that in the very near future, kids in special education will not only be reading but be exposed to Spanish and/or French. 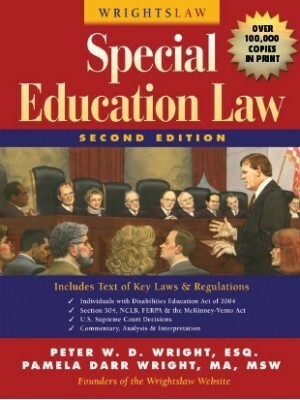 We beleive that the name Special Educaiton should be tossed and call it what it should be called. INDIVIDUALIZED EDUCATION. Individualized Education is not a location that requires your child to bring a pillow for the two hour ride to the school where their education is provided. Individualized Education is exactly what is says it is. I invision kids of all academic abilitiessitting and discussing the Spanish lessons and Algebra lessons. We each have unique talents and abilities just like everyone else.